Portrait artist Rob Hefferan’s collection of animal portraiture in Cardiff is an excellent example of his versatility. If you view his collections you’ll see the diversity of subjects. Underlying all is the beauty of form exquisitely captured not just in his subjects but also in the backdrops. The beauty of the female form is accompanied by the graceful curve of a stairway or the drape of a gown. He captures the emotions of his subjects as a true romantic with a twist of erotica. His equestrian collection captures the physical power of the horse but also we see fury in that power. His animal portraits are stunning so consider commissioning a portrait of your own favourite equine to display in a place of honour in your home. 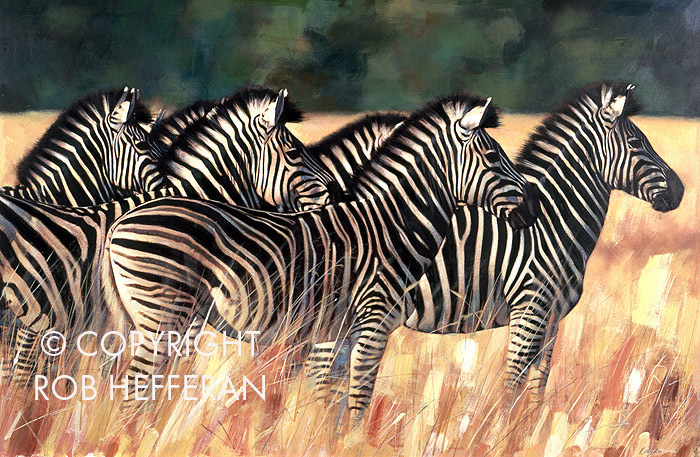 His Wildlife Collection depicts the confidence of the animals in their own habitat doing what comes naturally. In Cardiff, animal portraiture from the Wildlife Collection is an impressive addition to any setting where you want to project serenity and power. The portraits are calming. The wildlife original paintings are not for sale, however a bespoke print of each can be purchased. A wall of miniatures or one large print dominating an all white wall. Office spaces and children’s rooms are welcome settings for these beautiful prints. Most of us know someone who would treasure these as a gift. It’s a body of work unlike any of his other collections. One can only anticipate what his next project will be because there is no speculation. Animal portraiture in Cardiff by Rob Hefferan is a worthy collectable whether it’s your own animal, domestic or wild animals. He has proven himself capable of capturing them in unguarded moments just as he does people. Contact Rob Hefferan to schedule an appointment to view his work available animal portraitures for purchase or commission a portrait of your animal. You don’t have to be an animal lover to love his work. Be sure to view his other collections that might hold more interest for you. Commission a portrait of your family or other loved ones. You will be pleased with the results because among his many artistic gifts he possesses is the ability to capture the secret and the promise found in a glance or the turn of a head.